An armored personnel carrier on patrol near Beni, where the UN Organization Stabilization Mission in the Democratic Republic of the Congo (MONUSCO) is supporting the Congolese National Forces (FARDC) in an operation against the Allied Democratic Forces (ADF) rebel militia. March 2014. A United Nations human rights report released today says that a Uganda-based rebel group has committed grave violations of international humanitarian law in crisis-riven north-eastern Democratic Republic of the Congo (DRC). The report says that the Allied Democratic Forces (ADF) committed the violations, which were systematic and extremely brutal, and which may amount to war crimes and crimes against humanity, over a three-month period at the end of 2014 in Beni territory, North Kivu province. “In light of the magnitude and the persistence of the attacks by ADF combatants, I call upon the Congolese authorities to take, as soon as possible, all the necessary measures to put an end to the massacres of civilians,” said the Special Representative of the Secretary-General in the DRC, Martin Kobler. In total, ADF combatants attacked 35 villages, killing at least 237 civilians, including 65 women and 35 children, between 1 October and 31 December 2014, with a further 47 civilians wounded, 20 abducted and two sexually abused. The attackers used machetes, hammers and knives, among other weapons, to wound or execute civilians. Some had their throats slit, were shot at while trying to flee or were burned alive in their homes. Several cases of looting and destruction of property were also documented. The report details the results of in-depth investigations conducted by the UN Joint Human Rights Office in the Democratic Republic of the Congo (UNJHRO) and features more than 180 testimonies from victims, witnesses and others. It concludes that the total number of victims could be much higher as human rights officers encountered many difficulties in conducting their investigations and could not access some areas for security reasons. Also documented in the report are violations of international humanitarian and human rights law committed in the same period by members of the Armed Forces of the Democratic Republic of the Congo (FARDC) in operations against the ADF. Investigations by the Congolese authorities into massacres in Beni led to the arrests of at least 300 people, including around 33 FARDC members. Two FARDC officers and four ADF leaders were convicted by Congolese military justice authorities in November 2014 for the killing of the FARDC General Mamadou Ndala and for participation in an insurrectional movement. “I welcome these initial steps towards justice, but urge the authorities to redouble their efforts to hold to account all those implicated in the series of truly horrendous crimes that ravaged the Beni area last year,” said UN High Commissioner for Human Rights Zeid Ra’ad Al Hussein. 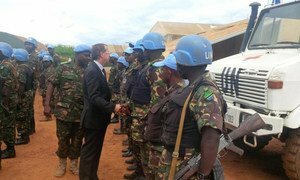 Secretary-General Ban Ki-moon has strongly condemned the killing of two United Nations peacekeepers and the wounding of thirteen others in the Democratic Republic of the Congo (DRC) following an ambush in the North Kivu region, a spokesperson for the Organization has confirmed.